The Time in Between is classic KA. It’s reminiscent of books like Motorcycle Man and Sweet Dreams where the reader forms a life-like bond with the characters. Ashley’s ability to form a strong emotional connection with the fictional worlds that she builds is like no other author. I could not put this book down. As the 3rd and final installment in the Magdalene series, it did not disappoint. 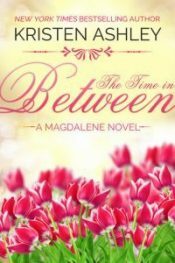 Spanning the course of roughly 2 decades, The Time in Between chronicles the story of Coert and Cady. Young, misunderstood, and unappreciated by her family, Cady falls in with a tough crowd. And while they are by no means on the up and up, they embrace Cady and look out for her. When Coert enters the picture, then known as Tony, he starts to run with the same crew. And while they too embrace him, it’s for a very different reason. Whereas Cady is looking for a replacement family, Coert/Tony is looking to rise up within the criminal enterprise that’s being built. What they find in each other is love and acceptance. But the consequences of both Coert/Tony and Cady’s actions ultimately tear them apart–for 18 years. Told in alternating present day and year’s past voices, Ashley explores what happens when young love turns deadly and if it can truly stand the test of time after years of being apart. Whether this is your 1st or 31st KA book, it will only leave you wanting more. Though this series is complete–and this book can be read as a stand alone–there’s plenty of KA goodness out there. Heart-wrenching throughout, I have nothing but good things to say about The Time in Between.